T. Ritson Ferguson is the current fund manager. He started managing this fund in November 2001. He is assisted Steven D. Burton and Joseph P. Smith. It has total net assets of $4.48 billion. Its annual expense ratio is 1.31%. It also has a 12-month dividend yield of 2.02%. Investors of this fund have just received its dividend in September 2012 in the amount of $0.09. There is a 12b1 fee of 0.25% and a front-end sales load fee of 5.75%. The fund’s index benchmarks are Barclays Capital Aggregate Bond Index and S&P 500 Index. 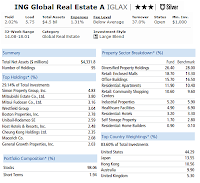 The other classes of this fund beside Class A (IGLAX) are Class B (IGBAX), Class C (IGCAX), Class I (IGLIX), Class O (IDGTX), Class R (IGARX) and Class W (IRGWX). The minimum initial investment is $1,000 for brokerage account. 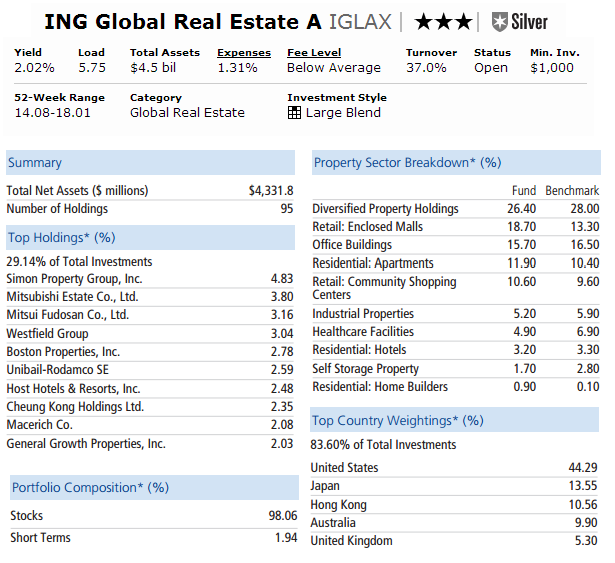 As of September 2012, this international equity fund has 95 total holdings. The top 10 holdings represent 29.14% of the total investments. The top 10 stocks are Simon Property Group Inc (4.83%), Mitsubishi Estate Co Ltd (3.80%), Mitsui Fudosan Co Ltd (3.16%), Westfield Group (3.04%), Boston Properties Inc (2.78%), Unibail-Rodamco SE (2.59%), Host Hotels & Resorts Inc (2.48%), Cheung Kong Holdings Ltd (2.35%), Macerich Co (2.08%) and General Growth Properties Inc (2.03%). The top property sector breakdown is Diversified Property Holdings (26.40%). According to the fund prospectus, the principal investment risks are company risk, concentration risk, convertible securities risk, currency risk, Foreign Investments/ Developing and Emerging Markets risk, Initial Public Offerings Risk, Issuer Non-Diversification Risk, Liquidity Risk, Market Risk, Market Capitalization Risk, Other Investment Companies Risk, etc.